On 22 and 23 November the International Joris Ivens Symposium in Hanoi brought together a wonderful mix of Vietnamese film veterans, who had collaborated with Joris Ivens and his wife in the 1960s and a group of film scholars from Canada, USA, Indonesia, Australia, France, China and The Netherlands. The magnificient book of film historian Günter Jordan about Joris Ivens' East-German films, entitled 'Unknown Ivens' ('Unbekannter Ivens') will be presented on 25 November at the legendary UT Connewitz film theater in Leipzig. Next to the lecture by Jordan 'Joris Ivens at DEFA and in the GDR' the films Die Windrose (1958, The Rose Compass) and Rain (1929, Regen) will be shown. In 2011-12 the Chinese Australian artist Shen Jiawei painted a large canvas Spain 1937 (220x300). It depicts a group portrait of eminent intellectuals and artists who participated in the Spanish Civil War, including Joris Ivens, George Orwell, Ernest Hemingway, Pablo Neruda and André Malraux. Premiere 'Marceline. A Woman. A Century'. On 16 November at IDFA Amsterdam the documentary Marceline. A Woman. A Century made by German director Cordelia Dvorak will be premiered. This portrait of the strong-minded filmmaker Marceline Loridan-Ivens (1928-2018) and fourth wife of Joris Ivens, saw its final editing two days before she passed away. In this film we see Marceline serving her guests coffee or vodka in her Paris apartment at the rue des Saints Peres. Every year IDFA's Guest of Honor compiles their Top 10 favorite films that inspired them. This year Czech filmmaker Helena Třeštíková will present her Top 10 in a public Filmmaker Talk. The films will also be screened during IDFA 2018. She selected among others Joris Ivens' La Seine a rencontré Paris (1957). Třeštíková explains why these films are important to her in this article. On 18 September Marceline Loridan-Ivens (19 March 1928, Epinal) passed away in Paris. She was born in a family originating from Lodz (Poland), which emigrated to France due to anti-semitism. During her working career she was pollster, filmmaker, producer and writer. She was the fourth and last wife of Joris Ivens, whom she first met in 1963. The couple married officially in 1977. 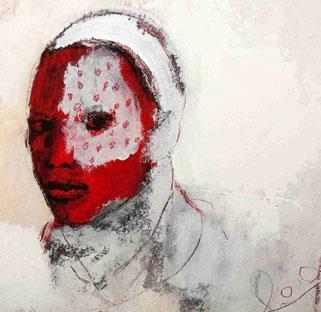 Her life was marked by wars. The DEFA Foundation in Berlin released a new German DVD with Ivens-films in conjunction with the book Günter Jordan published about these films. DEFA already had launched a DVD with Song of the Rivers in and now presents The Wind Rose, Friendship Will Win and The Peace Cycle Tour Warsaw-Berlin-Prague 1952. The long awaited book (in German) about Ivens and his East-German films, written by thé specialist in this field, Günter Jordan, has been published by the DEFA Foundation. This beautiful book describes in 680 pages the triumph in the 1950’s, the condemnation at the end of the 1960’s when Ivens became persona non grata in the GDR, until the resurrection of Ivens’ DEFA-films. Award winning Canadian documentary filmmaker Peter Davis presented his documentary Digging the Spanish Earth. Thanks to his interviews with Joris Ivens, Martha Gellhorn, Helen van Dongen and George Seldes, this film is of historical importance itself. Peter Davis also revisited locations in Madrid and Fuentedueña de Tajo where The Spanish Earth was shot in spring 1937. Since six years Tian Wang (1976, Tongxiang 桐乡), is doing research for a dissertation about Joris Ivens and Modern China between 1938 and 1988. It was Régis Debray who advised her to study Ivens’ films in the framework of the theories of French historian Marc Ferro ‘Le film, l’agent et produit de l’Histoire’. For Tian Wang it is essential not only to study paper documents, but especially to meet and speak the people involved, both in China and the West. Entrance of the Dutch Cultural Center in Shanghai, part of the Dutch contribution to the World Expo. 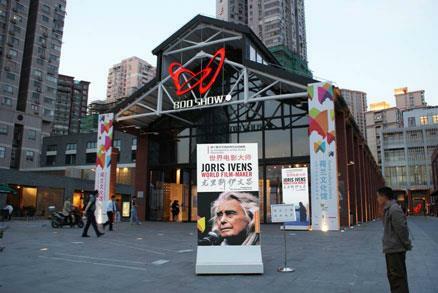 During the weekend of 9 and 10 July at the World Expo in Shanhai, Joris Ivens will be honored in a true `Joris Ivens weekend`. On Friday evening and Saturday afternoon and evening 13 films by Joris Ivens are screened. The films are grouped around six themes: Introduction / Stories in China / Against Facism / Avant-garde / China / Poetry and Cinema. Mrs Loridan-Ivens and the European Foundation Joris Ivens will be present to introduce the films. The theatre space at the Dutch Culture Centre will also host a small exhibition of photographs of Joris Ivens and Mrs Marceline Loridan-Ivens. 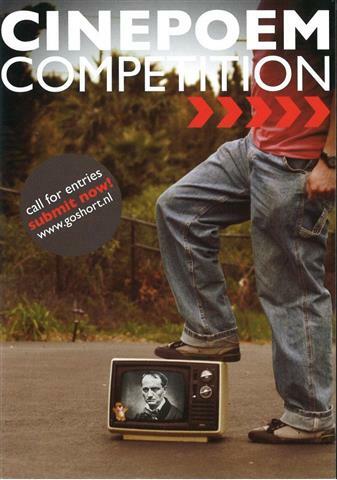 The European Foundation Joris Ivens will organize in March 2011 it`s first cinepoem competition. Wijtertuin and GoShort join into this new media experience. Wintertuin is a pioneer in the Netherlands in the field of crossover in literary productions. Go Short - International Short Film Festival Nijmegen is already in preparation for its third edition. Now these three organizations are bundled to organize a high quality, innovative and distinctive programs around the European cinepoem. During this unique event the Wintertuin-Joris Ivens Award will be awarded to an upcoming European talent. 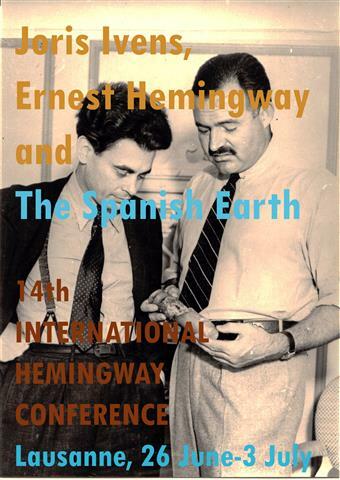 The `14th International Hemingway Conference’ started last Friday in Lausanne. It’s a biannual conference with dozens of lectures on various aspects of the life and work of American writer Ernest Hemingway. This year, five film scholars from the United States and France provide lectures dealing with the cooperation between Hemingway and Ivens during the Spanish Civil War. 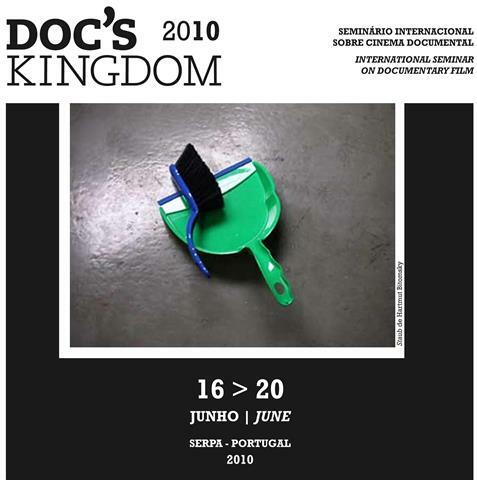 In the Portuguese city of Serpa the 10th edition of the Documentary Seminar `Doc`s Kingdom` started on Wednesday 16 June. This years theme is focussing on the use of archival footage in documentaries. Filmmakers like Hartmut Bitomsky, Edgardo Cozarinsky and Susana de Sousa Dias will be present to debate about their own films. The Ivens Foundation is partner in this seminar. Beyond the use of archival images, the notion of archive at the origin of the act of filming. Gathering filmmakers who have intensely worked with previously existent footage, and not forgetting that side of their activity, we propose the analysis of different paths which both enlarge and transform that binomial (image and archive). The idea of gathering, collection, inventory, as a return to an original state and, at the same time, as creative impulse. The archive, i.e., the (re)founding space. On Saturday May 29 in Paris, the Minister of Culture, Frederic Mitterrand, in the presence of first lady Carla Bruni-Sarkozy will reveal a 12 meters high outdoor sculpture on Joris Ivens. The statue is the work of Irish artist Bryan McCormack. The image is in particular a tribute to the film Pour le Mistral (1966) on the wind, a recurring theme in Ivens` work, from his earliest film in 1929 until his last filmUne Histoire de Vent (1988). The title of the artwork "When Joris Ivens meets Hraesvelgr" also refers to the wind giant from Norse mythology. In the top of the image is a classic picture of a naked man seen with a playful globe in his hand and two enormous moving wings on his back. The symbolism of the sculpture also seems to refere to the nickname of Ivens “The Flying Dutchman ", the mythical figure of the rebel ship`s captain who tart the winds and storms of all oceans and is doomed forever to sail. "In Nordic mythology, the giant Hraesvelgr, half man, half bird sits at the edge of this world making the wind blow, all the winds are its children sent out across creation by the flapping of its wings. The Dutch filmmaker Joris Ivens made over 80 films between 1912 to 1988 and in particular «For The Wind» (1965). 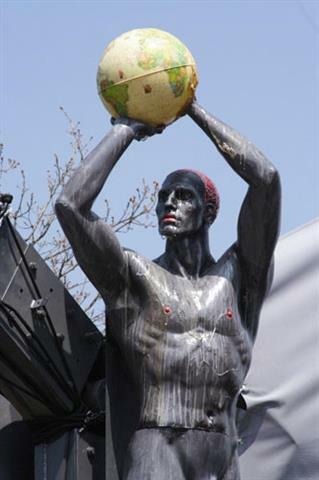 This sculpture is the fruit of their symbolic «meeting». It speaks of wind «of air in movement» that is dispersed, that is reunited, that warms and cools, that invites travel. The sculpture, like the giant, is immobile. However, it is the wind that creates the movement in the trees surrounding it. The reunion of movement versus immobility exists, but in a context that is opposite to the legend. The artist Bryan Mc Cormack was born in Ireland in 1972." Nanguila Tomorow is a film about the independence of the Mali federation (Mali and Senegal), founded in april 1960, shown by telling the story of a boy, which returns to the city and to his family after having experienced turmoil and then becomes active in irrigating the fields. Doc `s Kingdom, the international documentary seminar in Serpa, Portugal is always striving to have all the directors of the films present for public debates and panel discussions. Doc`s Kingdom 2010 will present several examples of footage films. The seminar will maintain distinctive elements, such as the promotion of contact between different generations of documentary filmmakers and documentary styles. The European Foundation Joris Ivens is a partner of Doc `s Kingdom. Visit the Doc `s Kingdom website (English) for the full program.